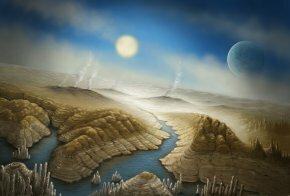 An Artist's concept of the surface of the newfound exoplanet Kepler-452b, a planet about 60 percent wider than Earth that lies 1, 400 light-years away. Kepler-452b is likely rocky, and it orbits its sunlike star at the same distance Earth orbits the sun. Kepler-452b lies 1, 400 light-years away, and is the only planet known in its solar system. 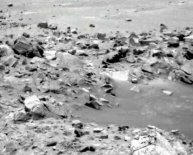 It's about 60 percent wider than Earth, which gives it a "better than even" chance of being rocky, researchers said. The planet is probably about five times more massive than our own, making it a so-called "super Earth." 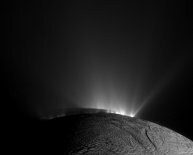 It likely possesses a thick atmosphere, lots of water and active volcanoes. The exoplanet completes one orbit every 385 days, so its year is only slightly longer than Earth's. And Kepler-452b circles a sunlike star that's just 10 percent bigger and 20 percent brighter than the one that hangs in Earth's sky. But Kepler-452b's star appears to be considerably older than the sun — 6 billion years, compared to 4.5 billion years. "It’s awe-inspiring to consider that this planet has spent 6 billion years in the habitable zone of its star; longer than Earth, " Jenkins said in a statement, referring to that just-right range of distances that could support the existence of liquid water on a world's surface. "That’s substantial opportunity for life to arise, should all the necessary ingredients and conditions for life exist on this planet." Kepler's total haul of potential exoplanets is now nearly 4, 700. Just 1, 030 of these finds have been confirmed to date, but mission scientists expect that the vast majority — 90 percent or so — will end up being the real deal, just like Kepler-452b. During its original mission, Kepler stared at more than 150, 000 stars simultaneously, looking for tiny brightness dips caused by planets crossing these stars' faces. Kepler's dataset is therefore huge, and it has taken researchers a while to analyze it and address the main goal of the $600 million mission — determining how common Earth-like planets are across the Milky Way galaxy. 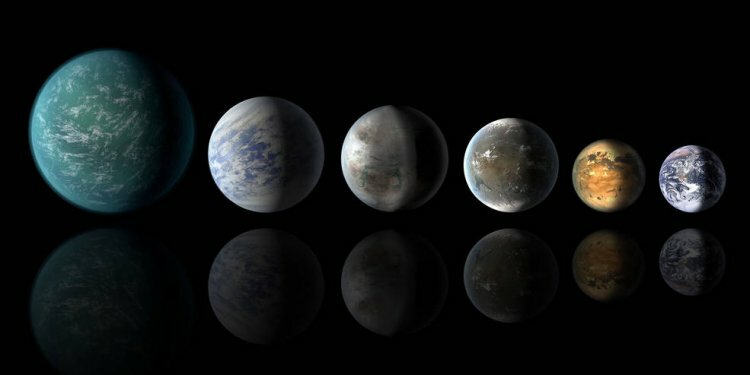 Analyses of Kepler observations to date suggest that about 20 percent of the Milky Way's stars harbor at least one rocky planet in the habitable zone, but this number will be revised or refined with additional study, researchers said. 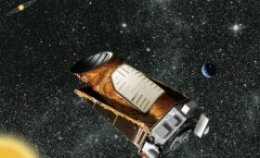 "Continued investigation of the other candidates in this catalog and one final run of the Kepler science pipeline will help us find the smallest and coolest planets, " the SETI Institute's Joseph Twicken, lead scientific programmer for the Kepler mission, said in a different statement. "Doing so will allow us to better gauge the prevalence of habitable worlds." "I really expect that discoveries will be coming from Kepler for the next several decades, " he said. The exoplanet Kepler-452b circles its parent star in an orbit very much like that of the Earth around the sun, as seen in this NASA diagram. Kepler-452b takes 385 to orbit its star, and is in the habitable zone where liquid water could exist, making it a close Earth cousin. Yes - We may not have found them yet, but they're out there. No - Aliens are just part of science fiction. Kepler's original observations required tremendously precise pointing — an ability the telescope lost with the second reaction-wheel failure in May 2013. But Kepler isn't done observing the heavens. In May 2014, NASA approved a new mission called K2, in which the spacecraft is studying a variety of cosmic objects and phenomena, including distant supernova explosions, comets and asteroids in our own solar system and exoplanets. 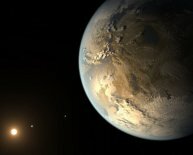 And a compromised Kepler can indeed still spot alien worlds: NASA announced the K2 mission's first exoplanet find in December 2014. The first exoplanet was spotted in 1992, and researchers have discovered nearly 2, 000 confirmed alien worlds in the 23 years since then (the exact number varies depending on which database is consulted). The Kepler spacecraft is responsible for more than half of these finds.